The Challenge: Our client “Smart Simple Marketing”, a digital marketing agency, wanted to host an event that allowed B2B marketing to SME entrepreneurs and start up CEOs. Relevant companies would have their booths set up providing information, services, and prospective client needs assessments to encourage sales, improvement in KPIs, and exchange of latest strategies surfacing in the marketing domain. With key attractions including guest experts speaking, networking opportunities and knowledge sharing, Email Marketing Simplified 2015 was an event focused on building an environment that maximized attendance, minimized costs, and best promoted exhibitor expertise to important leads with high potential of sales conversions. No pressure right? Well, maybe just a tad bit. The 2 Options: The traditional approach available to host this event was adopting the physical venue based strategy. Halls had to be booked, logistics coordinated, guest speakers flown in, money invested into set up and branding, administrative and staffing arrangements, printing, printing distribution materials, and of course the uncertainty of the volume of attendees to be expected had to be faced. With target audience from around the world being targeted, there is no precise way to be sure of a headcount- thus as a host you have to be equally ready to accommodate a fifty guests, or an entire stampede of marketing enthusiasts that may appear out of thin air- there’s never a confirmed answer to the mystery. The second option for the host was to take the virtual route. With evolving technological capabilities, increasingly busy work schedules of the targeted business clients, and the need to organize this event over a 3 day span to not overwhelm attendees with knowledge- virtual events provided a very flexible and dynamic environment to promote the brand and gain access to prospective/existing clients. This removed the need to allocate budgets to physical venue and set up expenses, instead allowing more focused spending to ensure the ROI was worth every dollar spent. Guest speakers could communicate with guests through webinars, answer queries in live Q&A sessions, and in fact secure audience engagement in a more personalized way. Thus, pursuing this option was a more liberating strategy to adopt considering the budget limitations, requirement to accomplish an extensive geographic outreach, and of course, the need to attract and capture new business. The Decision: After detailed consultations with the team at vFairs, Email Marketing Simplified 2015 was pursued using the virtual strategy by hosting an online event from the 10th-12th of Nov. Instead of losing sleep over the uncertainty and event planning, the client defined their exact requirements, which in turn were exactly catered to. The result? 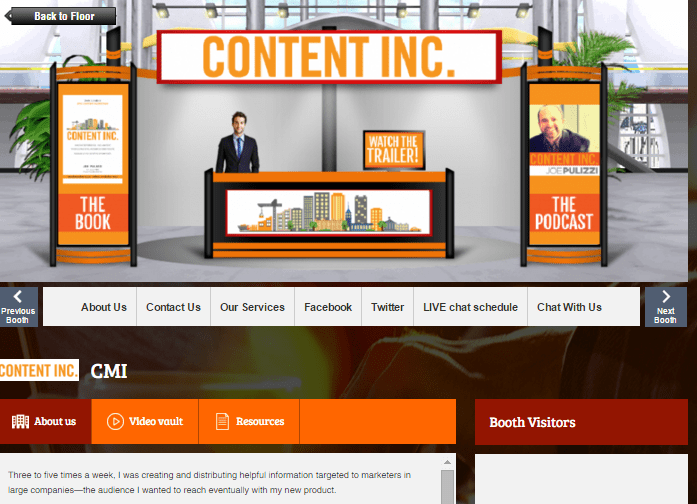 Hundreds of visitors and booth visits, and a seamlessly executed virtual event. 1) Global audience engagement: With the message no longer being restricted to a room full of people, the echoes of the right email marketing strategy impact, necessity, and benefits were delivered to the right audience at an impressive scale. The Exhibit Hall comprised of 9 independent booths; content marketing agencies had a live chat schedule that allowed chat contact without need to stand in queues, or suffer from the stress of losing leads because of high volume of attendees. Clearly marked tabs for content, service portfolio, and company overviews also made the sharing of information very simple without the staff having to monotonously repeat the details as new clients visited. Moreover, the client reach was now boundless- no capacity limitations, thus no need to worry about overcrowded venues and reservation expenses, and definitely no fighting for attention in long queues. 2) Insightful webinars: One of the strongest attractions of this event was webinars from renowned experts from the email marketing domain; both prerecorded and live webinars were hosted. A proof of the successful engagement achieved was 100% of the attendees saw the webinars in their entirety- the convenience of being able to log in and join the webinar regardless of location or schedule really helped the audience in deriving most value from the event, furthermore allowing them to watch replays later online even when the event had ended. Speaker and guests were able to communicate and brain storm in the moderated chat-rooms so all interactions remained focused, and provided powerful learning opportunities for all. 3) Effective lead management: Let’s be honest, the era of paper based forms is synonymous with the Stone Age- all valuable data is governed by emails, texts and databases now. The host was provided customized registration forms designed to match their exact requirements. This allowed them to generate reports with leads names, contact details, company name, etc. – all information necessary to cultivate new relationships and pitch marketing solutions. With 1002 registrations, you can imagine the number of trees the clients saved by eliminating the business card exchanged related formalities. 4) Mobile compatibility: Tech savvy clients nowadays are always on the go, this is why vFairs is a mobile compatible platform so your target audience can participate and interact through the device of their choice. If attendees wants to engage in learning over their lunch break, or check with the experts regarding any strategy flaws they may have- everyone had the opportunity to readily participate in the event as long as they had access to an internet connection. In conclusion, Email Marketing Simplified 2015 was a great success at connecting the hosts with almost a 1000 entrepreneurs, marketing managers, and other interested industry affiliates. With 3 days of exciting content, business leads, interactive learning, and never-before like geographic outreach, the analytics made it clear that virtual events are now surfacing as a pivotal piece of the puzzle that can fuel revenue growth for companies if leveraged the correct way.